I snuggled into my flannel sheets, with lazy thoughts of the coming year. I was on the cusp of drifting off when a sharp boom and a low rumbling reverberated through the building. My eyes popped open and I stared into the darkness. The bed rocked from side to side, dishes rattled in the cupboards, the walls groaned – it felt like a small freight train rumbling through my bedroom. My body remained paralyzed even after I understood what was happening. Earthquake. My heart pounded in my ears. Was this the infamous “big one”? And then, just as abruptly as the earth thundered through my apartment, everything stopped. There was a moment of bewildered calm before the piercing sound of an ambulance broke the silence. Living in the Pacific Northwest along the Cascadia Subduction zone, I have spent most of my life hearing about the major quake due to strike the area in the next 50-300 years. This minor shaking was but a blip on the radar, a minor tremor that lasted a mere ten seconds, but in the midst of it, felt much longer. The earthquake was labelled a modest 4.9 – enough to cause some shaking and a little bit of anxiety but no major damage. In spite of its mild nature, it was a reminder that life is always quivering on the brink of change. The sudden jolt of the earth suddenly shifting beneath us is similar to the shock of a new diagnosis of RA. Just like the uncertainty of “the big one”, RA triggers the fear of an uncertain future. It arrives without warning, breaking up the solid ground that supports us and knocks us off our feet. It can be difficult to calculate the initial impact – when the shaking finally stops, it’s time to assess the damage, pick up the pieces and rebuild from the ruins of what has been displaced. The aftershocks of RA can keep you awake long after that first shudder. The new ground of chronic illness is wobbly, in a constant state of flux, always threatening to knock us off-balance. Flares, pain, swelling, changes in disease activity, reducing meds, increasing meds, changing meds, adjusting to a new way of moving, constantly fine-tuning the flow of our daily life – these are the things that are always vibrating through our lives with RA, always expected but never foreseeable. When everything is swaying, it can be difficult to find something solid to take hold of – sometimes all we can do is listen to the vibrations in our body and sway with the shifts instead of against them. The major shake that upsets our life is the diagnosis – everything after that is simply the aftershock of living. The aftershocks are less devastating, but can continue on long after the major event. Living in the aftershock is challenging and often tiresome. It takes time, patience and grit to sort through the wreckage of an altered life. The good news is, over time the aftershocks will weaken and we can focus on rebuilding the little things that will help us get back on our feet and prepare us for future shock waves. We can never really be 100% prepared for everything, but if can arm ourselves with a little knowledge, and pay close attention to the rumblings of our disease, we might have a good chance of staying on our feet. There will always be tremors in life with or without RA. I try to take comfort in knowing I have already survived “the big one”, the bombshell of diagnosis. When life gets a little shaky I just take cover, hold on, and trust that when the quaking stops, I will crawl out of the rubble and, once again, put things back in their place. OMG! I’m glad it wasn’t more serious. But I love the simile between the diagnosis and getting your whole world shaken! Glad you’re ok, and that it was just another minor bump in the road. Just like RA. Yes, RA is always a bumpy road. We need good shocks driving over it 😉 Wishing you well with more good days than bad. 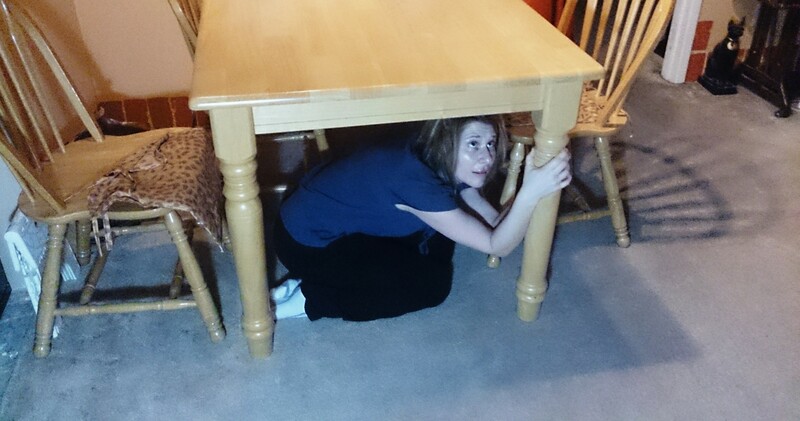 That was me 20 some years ago, quivering underneath the table with my kids. The aftershocks came all day long. And you are so right equating them with the aftershocks RA brings. We never know when, but we know they will come. I left California, but I cannot leave RA. What I like most about your blog is your positive attitude. Your comment about the fact that we can rebuild from the ruins of what is displaced is a good positive simile about RA. If you have RA you have to keep”rebuilding” or you are doomed. Since there is now some positive research going on, there is real hope as long as we keep fighting. Thank you for your kind compliment. I try to stay as positive as I can. There are so many lovely things in this short life and I try to focus on all the little blessings that are overlooked when we are faced with pain every day. Sometimes small pleasures can be a great distraction. I hope you endure more good days than bad in your battle. Stay well. Best, J.G. Even though you’d given us plenty of warning that your posts would be more intermittent, when I woke up this (Monday) morning and realized I hadn’t seen a regular Sunday post, I felt a real sense of loss. You’ve become such a part of my favorite weekend routine: a good cup of coffee, the Sunday paper, and posts from you. 🙂 I totally understand the need to step back and focus on other things. Just know the rest of us will be out here ready to welcome you and future posts! Awww…I am sending you hugs from Canada’s West Coast. Thank you so much for your kind words. I am however, working on a special post for Rheum awareness day on February 2nd, so you’ll see another new one very soon. Wishing you well, always. X.